" The repair is not yet finished so far, as still hampered by the weather"
A collapsed sheetpile on Jalan Haji Asmad, RT 06/02, Lenteng Agung began to be repaired. 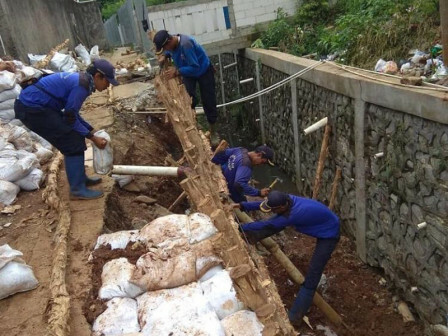 Jagakarsa Water Resources Executing Unit Head, Erna Yuni Nuraini said that sheetpile was collapsed last January after heavy rain hit Jakarta and its surrounding areas. "We send ten personnel to do repair. Repair itself has been ongoing since February 1 by doing survey, measuring its damage, and cleaning the location to smoothen the water flow," he told, Thursday (2/7). To prevent similar incident, his side installs 75 units of dolken wood pile at the location. "The repair is not yet finished so far, as still hampered by the weather," he said.